4Laboratoire de Géologie, Ecole Normal Supérieure, Paris, France. Received 25 August 2011; revised 10 October 2011; accepted 26 October 2011.
ern Hainan Island of tropical southern China. Huang et al. 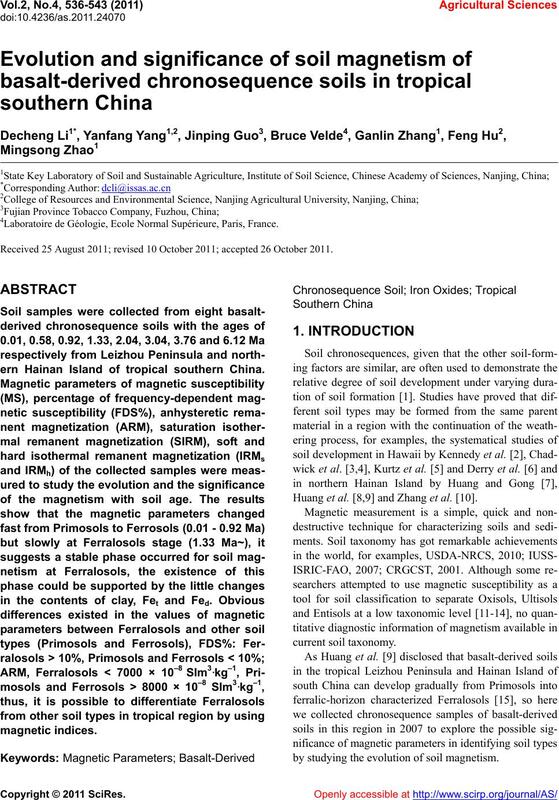 [8,9] and Zhang et al. .
by studying the evolution of soil magnetism. of the studied chronosequence soils (Figure 1). (SIRM-IRM300 mT) was defined as hard IRM (IRMh). DC−100 mT was defined as demagnetizing factor in 100 mT. Table 1. Basic information of basalt-derived chronosequence soils. and clay fractions were extracted by the pipette method. moved with 0.05 mol·L–1 dilute HCl and distilled H2O. Figure 2. The temporal change of magentic parameters of basalt-derived chronosequence soils. als but not of iron iorn oxdies. 24) proves that SIRM is dominantly contributed by IRMs. 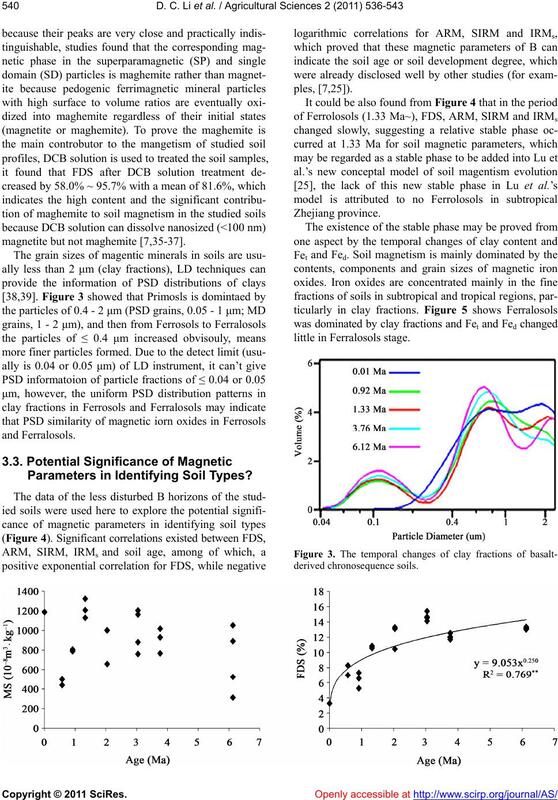 grains of ferrimagnetic phases in the older soils. ferrimagentic minerals to antiferromagentic minerals. erals were being progressively formed [9,14,25,32-34,]. Table 2. Iron oxides in soils at different developing and weathering age (cited from ). He, hematite; Mn, magnetite; Tm, Titanomagnetite; Go, gothite; Mh, maghemite; +, small amount; ++, certain amount; +++, larger amount. magnetite but not maghemite [7,35-37]. Parameters in Identifying Soil Types? 0.05 level, R2** significant at P < 0.01 level. Figure 5. 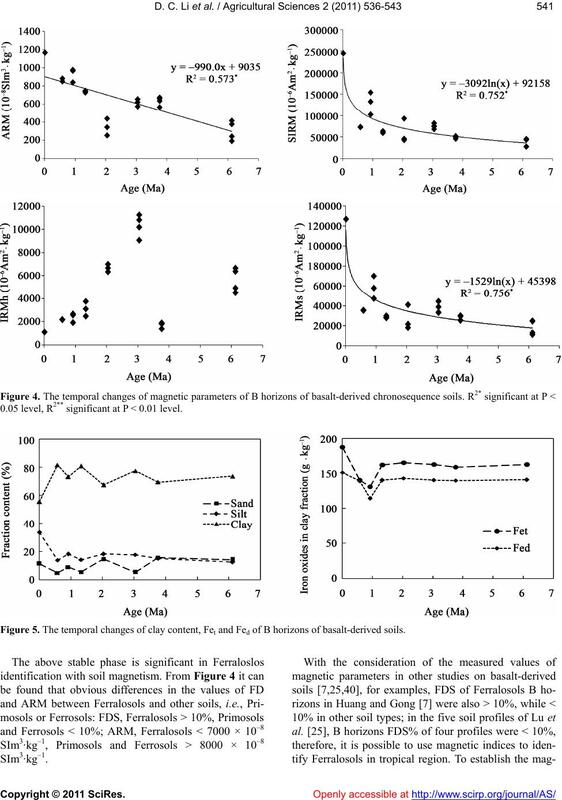 The temporal changes of clay content, Fet and Fed of B horizons of basalt-derived soils. phological, physical and chemical properties. identification in the tropical regions. University for their helps in soil sampling. ents during four million years of ecosystem development. of volcanic soils. Chemical Geology, 202, 195-223. 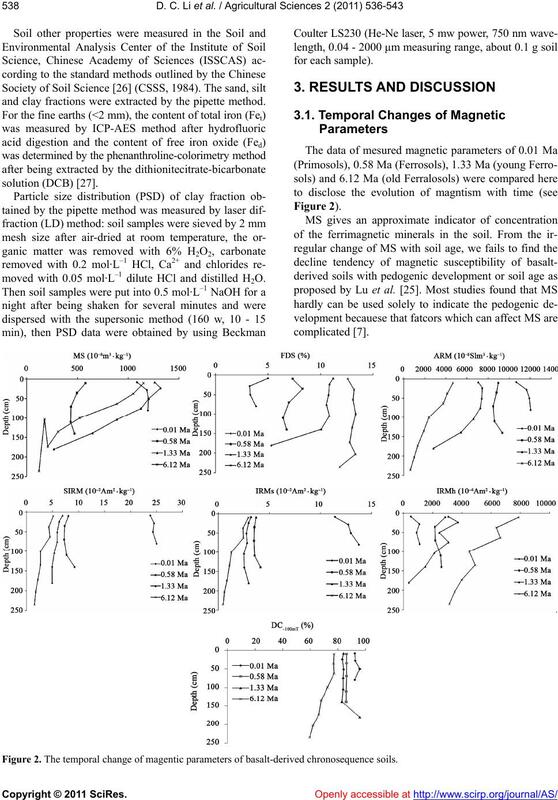 M.J. (2000) Refractory element mobility in volcanic soils. Derry, L.A., Kurtz, A.C., Ziegler, K. and Chadwick, O.A. export fluxes to watersheds. Nature, 433, 728-731.
rine Geology & Quaternary Geology, 20, 63-68.
nal of Agricultural Sciences, 14.
of soils derived from basalt in northern Hainan Island. II. Iron oxides. Acta Pedologica Sinica, 39, 449-457. Zhang, G.L., Pan, J.H., Huang, C.M. and Gong, Z.T. Mexicana de Ciencias Geológicas, 24, 261-269. J.M.D. 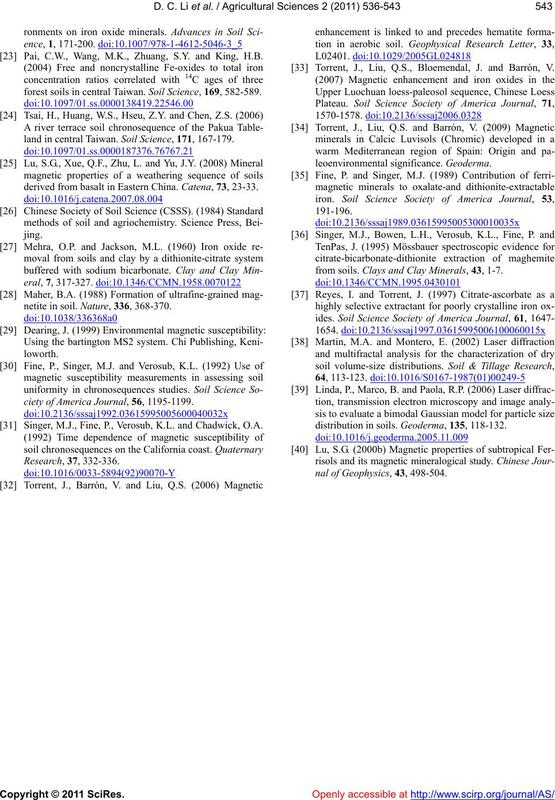 (1986) Magnetic properties of Brazilian Oxisols. parent materials. 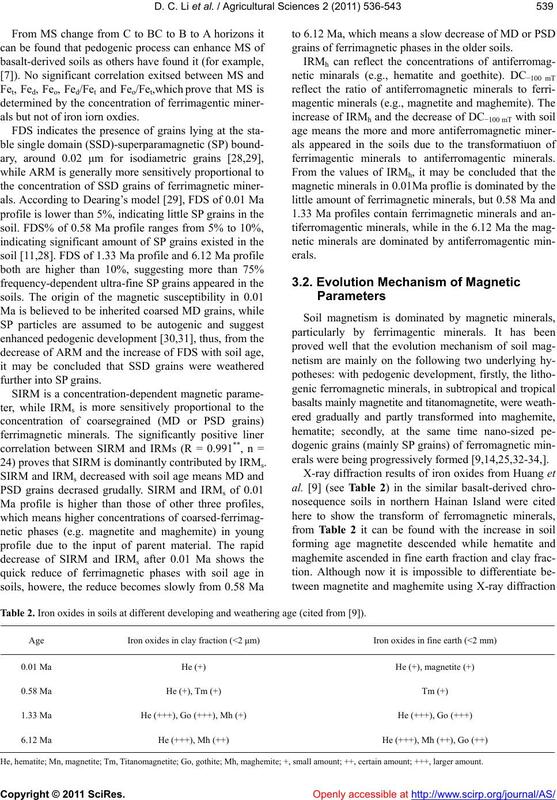 Geoderma, 96, 81-99.
dating and palaeomagnetic evidence from volcanic rocks. Acta Geophysica Sinica, 32, 550-557.
transgressive coastlines. Soil Science, 162, 2-9.
sequences in Spain. Geoderma, 23, 191-208. Pai, C.W., Wang, M.K., Zhuang, S.Y. and King, H.B. forest soils in central Taiwan. 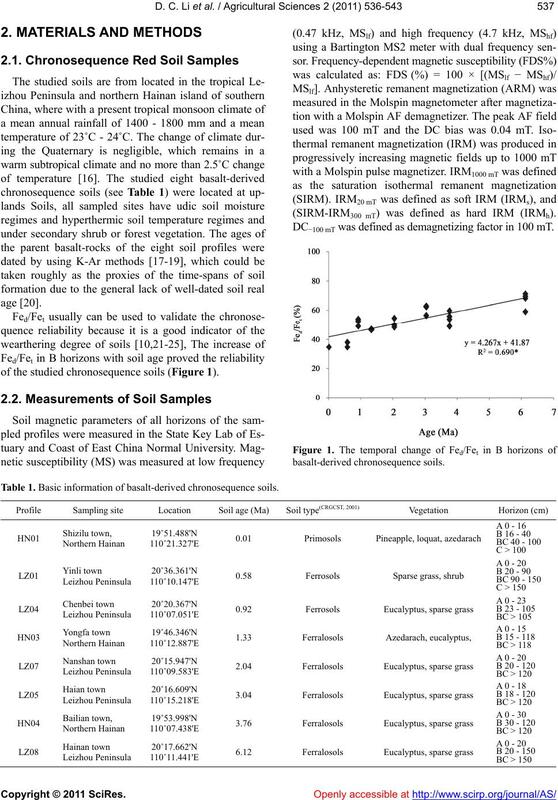 Soil Science, 169, 582-589.
land in central Taiwan. 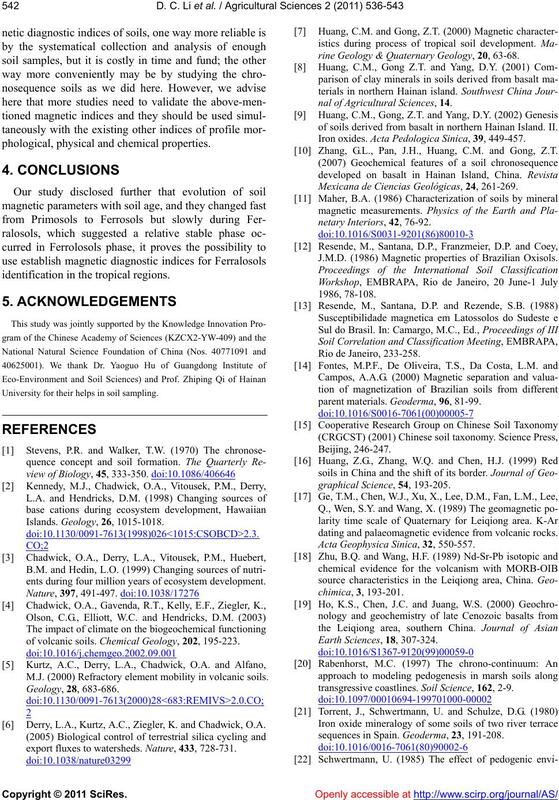 Soil Science, 171, 167-179.
derived from basalt in Eastern China. Catena, 73, 23-33.
netite in soil. Nature, 336, 368-370.
ciety of America Journal, 56, 1195-1199. Singer, M.J., Fine, P., Verosub, K.L. and Chadwick, O.A. Torrent, J., Liu, Q.S., Bloemendal, J. and Barrón, V.
from soils. Clays and Clay Minerals, 43, 1-7.
distribution in soils. Geoderma, 135, 118-132.
nal of Geophysics, 43, 498-504.